← Are we family centered? Families don’t think so! I am going to be deliberately provocative today… for a change. I think it is a very well done study, with a large cohort of patients that they used to make a prediction model, and another large cohort used to validate the model, which showed that the model gave consistent results. The meat of the initial results are in this figure. 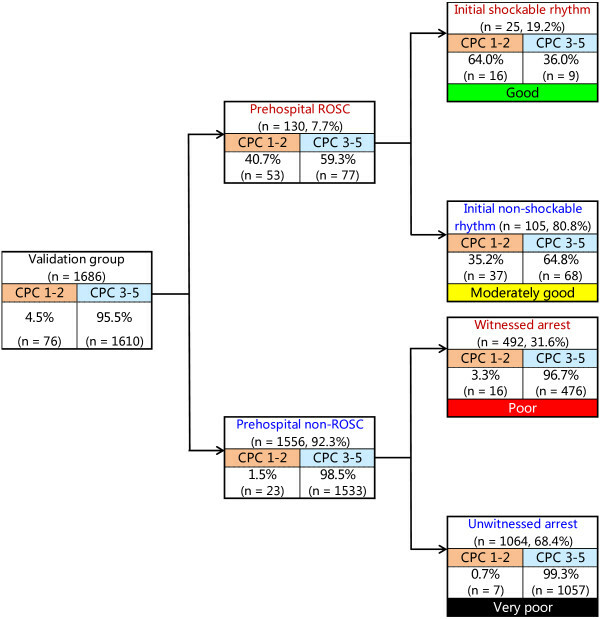 1 month survival with reasonable cerebral outcome was between 3.5% and 4.5%. You probably can guess what is going to come next: that is far worse than the survival with reasonable cerebral outcome of 22 week gestation babies. So if we were to apply the same logic to children that is invoked for extremely preterm infants by many perinatal societies, you should never offer resuscitation to children experiencing a cardiac arrest out of the hospital. Which would mean of course that survival would go down to zero, which would prove that we were right. Rather than say that, the authors examined predictive factors to see which were associated with a higher likelihood of a good outcome. If a child with unwitnessed OHCA is transported to the hospital before ROSC, even an adult-oriented physician can immediately understand that the child will have a very poor outcome and can counsel the family on whether to terminate the futile resuscitation. On the contrary, if a child has prehospital ROSC together with an initial shockable rhythm, the physician can immediately expect survival with a favorable neurological outcome and should perform resuscitation with advanced life support according to accepted guidelines. Which sounds entirely reasonable to me, and I think is analogous to what we should do with extremely immature babies: we should gather all the useful prognostic features (not just the gestational age in completed weeks!) and use that to counsel parents about whether to institute or limit resuscitation. In cases where outcomes are more likely to be positive, the default should be to institute active care and re-evaluate. In situations where the expectation of a good outcome is very poor, there should be an evaluation of the parents values and desires and a shared decision. I don’t know of any situation in neonatology which approaches the level of futility shown in this study for children with an unwitnessed arrest, it is possible that a best guess gestational age under 22 weeks in a boy who weighs under 400 grams might have a survival with good outcomes of less than 0.7%, but we don’t have enough numbers to know. I don’t think we can actually calculate prognosis accurately enough to have precise thresholds for “futility”, nor do I think we should have externally imposed limits of predicted good outcomes that should be applied to all families. So I would be very wary of trying to define the terms I just used, “outcomes are more likely to be positive” and “expectation of a good outcome is very poor”. Trying to put a numerical limits to those phrases risks replacing one simplistic rule with another: less simplistic, more rational perhaps, but also with the risk imposing the values of one group on another family. I’m sorry folks, but there are no simple rules. Or at least, there should be no simple rules. Life is hard, life and death decisions for others are even harder. This entry was posted in Neonatal Research and tagged Ethics, long term outcomes, mortality, Resuscitation. Bookmark the permalink.